(Newser) – First, the Golden State Killer—now the Zodiac Killer? 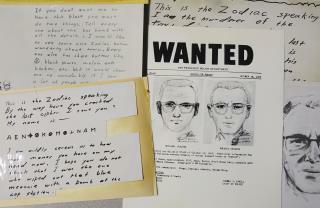 With DNA evidence possibly pointing to the former, police say the same method could help identify the long-sought Zodiac Killer, NBC News reports. Police in Vallejo, Calif., say they sent two envelopes from the Zodiac Killer to a private lab for a new kind of DNA analysis months ago. Any clear genetic profile will be given to a family-tree DNA service like the one used in the Golden State Killer case. But can DNA from envelopes and stamps dating back nearly 50 years still be used? "It's definitely possible," says a forensic scientist. "If they didn’t steam the stamp off and it was stored in a cool dry place, maybe there’s sufficient DNA left." The most compelling aspect of familial DNA referencing is that because the Zodiac's crimes predated such technology, he had no reason to obfuscate, design clever tricks to thwart detectives, in regard to leaving such trace evidence. It is one thing to be a thorough and careful criminal; it is quite another to predict the future, and even the Zodiac doesn't deserve that much credit. There are a few people who knew him that are still alive. They worked with him. He died in 2004. He may have had a female accomplice. There is audio that exists that proves this. Authorities may have that audio. However, they still need the DNA to prove it without a doubt. He briefly became a suspect in 1985. But, the audio I speak of - was extracted from a recording made just a few days after the murder of cab driver Paul Stein, the last known Zodiac victim.